Chalk grassland is the name given to the specific community of plants - both grasses and wildflowers (herbs) - which is able to tolerate the alkaline soil conditions found in areas where the underlying bedrock is chalk. A range of distinctive invertebrates are also associated with the habitat, including many which are not able to survive anywhere else. This community is only found where the grassland has not be agriculturally "improved" by the addition of farmyard manure or chemical fertilisers, or the use of herbicides. Where this has happened, the faster growing grasses tend to thrive at the expense of the less competitive species and consequently the diverse mix of grasses and wildflowers is destroyed. 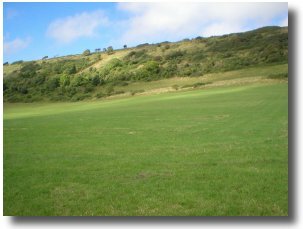 In recent years much of the chalk grassland in the UK has been lost, either due to agricultural improvement or because areas have been ploughed up to provide more arable land. What remains tends to be found on steep slopes where the topography of the land has made access with machinery difficult, although even these areas may have had fertiliser applied from the air in the 1950’s. Thus our remaining chalk grassland has been identified as a UK Biodiversity Action Plan priority habitat , and many areas are given additional protection from future mismanagement by being designated as Sites of Special Scientific Interest. Herb-rich chalk grassland generally requires either continuous light grazing or heavier periodic grazing to keep the sward height down and prevent the encroachment of coarse grasses and scrub. Sheep and/or cattle are usually the most effective grazing stock for a managed site. Decisions made regarding the type of stock selected and the timing and level of grazing most desirable for the nature conservation interest of a site are dependant upon the plants and butterflies known to be present and the character of the site itself. It is important that some structure is retained within the sward for the insects and other interests, but the grazing must be adequate over successive years to ensure that scrub doesn’t encroach and that the coarse grasses don’t become too dominant. 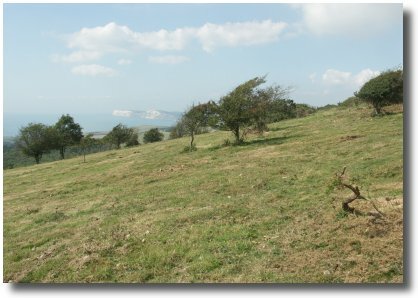 Wight Conservation owns over 110 hectares (270 acres) of chalk grassland at Wroxall Manor Farm (76 hectares / 188 acres, of which have been re-created on ex-arable land), and just over 8 hectares (almost 20 acres) at Coombe Down . 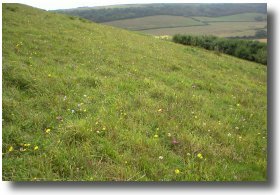 A further 23 hectares (57 acres) of semi-improved grassland over chalk on Brighstone Down is now being managed without fertilisers or herbicides in an effort to “starve out” the coarser more competitive species and so encourage other grasses and wildflowers to colonise the site again. There is also an area of just over 18 hectares (45 acres) on Mottistone Down belonging to Wight Conservation which is a mosaic of unimproved chalk grassland (almost 6 hectares / 15 acres of which is SSSI ), scrub and cleared ground which was, until recently, forestry plantation..